Marissa Nadler has become one of my favorite singer/songwriters in recent years, as her powerful voice and somber instrumental work has blown me away on a regular basis. Nadler has announced that her sixth full length album July will be released on Sacred Bones February 4th, and she has released the first single “Dead City Emily” which can be streamed below. It looks to continue all of the elements I’ve loved about her material in the past without sounding like a retread of previous work, and I’m excited to hear the rest. Boston-based singer Marissa Nadler has shared the first track, Dead City Emily, off her forthcoming sixth full-length album, July, coming out on February 4th on Sacred Bones (US) and February 11th on Bella Union (ROW). Recorded at Seattle’s Avast Studio, the album pairs Nadler for the first time with producer Randall Dunn (Earth, Sunn O))), Wolves in the Throne Room). Dunn matches Nadler’s darkness by creating a multi-colored sonic palette that infuses new dimensions into her songs. Eyvand Kang’s strings, Steve Moore’s synths, and Phil Wandscher’s guitar lines escalate the whole affair to a panoramic level of beautiful, eerie wonder. Her voice, too, is something to behold here, at once clarion but heavy with the kind of tear-stained emotion you hear on scratchy old country records by Tammy Wynette and Sammi Smith. Long gone are the days when Nadler summoned images of 1960s folk singers who got lost in the woods. She is a cosmic force on July, shooting these songs to euphoric highs and heartbreaking lows. 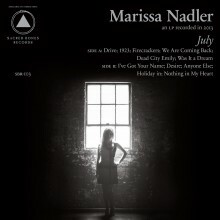 July is the kind of release that reminds you why NPR counts Nadler’s songwriting as so “revered among an assortment of tastemakers.” This is a singular achievement for the artist, a record she couldn’t have made earlier in her career because, as every songwriter knows, she didn’t just write these songs: She lived them.